The quartet will be performing the music of Haydn, Ravel, Beethoven, Malecki and a composition composed by a Malaysian composer in the concert. 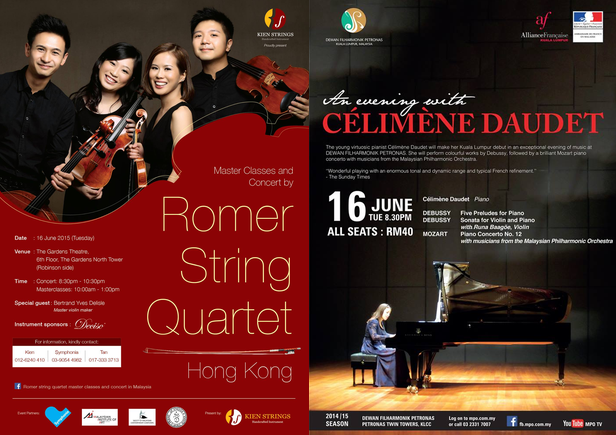 The Romer String Quartet is a ensemble formed by musicians from Hong Kong. As teaching artists, Romer String Quartet is the Ensemble-in-Residence of The Chinese University of Hong Kong. The quartet was invited as jury member and guest performer at the Hong Kong ‘New Generation 2014 Concert’ composition competition.